Remember Fashion is for Every Body's runway show last year? You know, the one where the banner photo right above this text happened? Well, it's back in a bigger, better, even more inclusive iteration called Boundless. 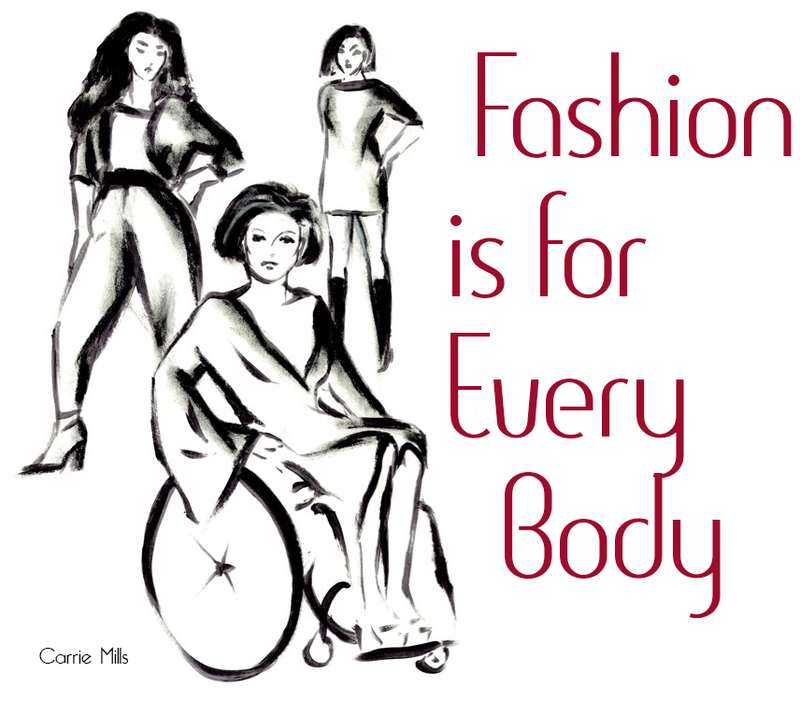 This year, Fashion is for Every Body is partnering with Empower Tennessee, a local organization promote opportunities for people with disabilities to strive for greater independence, to produce the show. We've chosen Studio615 as our venue - which, in my opinion, is the perfect place to put on a high-end fashion show (just ask Nashville Fashion Week). It's big enough to allow for an expanded food/drink/shop/photo experience to accompany the runway show. We're bringing back the video clips and ramping up the AV experience in general. Six designers are showing this year - four returning and two newcomers. Because Boundless is inclusive and adaptive you're going to see pieces never seen before and our designers are eager to show just how well they can create non-sample-sized clothing. This time around they'll be dressing over 30 models! Last year I had to beg folks to walk the runway. This year I've had to turn people away. If you're interested in attending Boundless I will remind you that last year's Fashion is for Every Body show sold out four days in advance. We have tiered and time-sensitive pre-sale pricing this year that will allow you to get the best seats for the lowest price. We also have a VIP package with preferred seating, a gift bag, and early access to food, drink, shopping and step-and-repeat. If you're interested in helping Fashion is for Every Body further fund Boundless (because ticket revenues will only cover about a third of our expenses) and our other fashion-inclusive projects please consider donating and/or sharing our GoFundMe page. If you're really lazy - like me - you can just use the Donate button on our Facebook page. I'm happy to announce that most of our models are returning to us from last year's Fashion is for Every Body show. Speaking of which; in case you missed it, one of our models used the confidence she gained from being a part of Fashion is for Every Body to speak out against a social injustice at her own high school. You can read the news story one of many media outlets ran, then read Ashley's story in her own words below. When I was told I wouldn't be able to attend my senior prom, I was undoubtedly upset and confused as to why they were telling me it was simply illegal for me to attend and that no exceptions were to be made. The school had been amazing and was always there whenever I needed services throughout my home-bound experience. I was no stranger to home-bound. I was placed on it every time I had to recover from different procedures, which sometimes took months on end, and there would be complications that kept me out even more [Note: Ashley has Cerebral Palsy, Graves Disease, and other conditions that often require medical intervention or hospitalization]. Things that were out of my control. Things I wish wouldn't kept me out of the actual school building so I could have the experience my peers had. I wish I could've hung out with my friends on more occasions than basketball games and other activities with the school. One of the reasons I was upset was because I received no clear explanation as to why I couldn't attend and wasn't told about any exceptions. I was simply told no and that was the end of the conversation. I'm not one to draw attention to situations, especially if it's going to cause tension and a scene. I'm a very shy person in general but I decided I had to do something. I had to make sure that the kids with disabilities that attended this school after me didn't have to go the route I was going; contacting the media. By the time I had finished with the initial meeting at the school the power of social media had already taken over. The news had already been contacted - not by me or my family, but by people who had seen the post my aunt posted minutes after we found out I couldn't attend. Strangers I didn't even know were rooting for me and backing me up. The post hadn't been up thirty minutes and it was shared a thousand times and counting. As I said before, I wanted to spread awareness and make sure that the home-bound policy (that I was made aware of after every major news station had picked up the story.) was either revised or done on a case-by-case basis for those who are too sick to be in a school building due to their illness but not too sick to, on occasion, go support a school baseball team or go and support one of their peers in a play. Eventually I was given a form for my doctor to fill out stating I was healthy enough to go to prom. People like me that are on home-bound have bad days -and of course, good days- but our bad usually outdoes the good, meaning the normal high school experience I mentioned I wanted is far from reality. Although I did bring a lot of attention to the matter at hand I'm glad that I did it in a positive way, because in the long run, it paid off and I got what I wanted. I got the policy revised/changed for the future. I hate that it had to go as far and as public as it did, maybe if I would've been offered the form in the beginning, this whole news thing would've been avoided. Two days after my form got approved it was prom day. I got my hair done in a style I never would've imagined myself wearing and it was beautiful. I got my makeup done and didn't recognize myself at first. I did a photo shoot in my dress for Fashion is for Every Body and looked absolutely stunning in the pictures I've seen. When I got to prom, danced the night away took funny pictures with my best friends; when the ultimate shock of being announced prom queen at the end of the night wore off the reality set in. I am left with the belief that everything is happening for a reason, and I believe that it was meant to happen this way. I was meant to become a voice for others who don't yet have the power to speak for themselves.